Halloween is almost here! Sadly we weren’t able to finalize our Michael Myers recipe in time (there is always next year). However, we decided that we would share some tips on how to throw an easy and fun Horror Movie themed party! Horror movies are such a huge part of our life. Literally, horror movies saved our first date and are one of the reasons we are getting married! Decor isn’t always so important for a movie watching party. That being said, if the movie is the background noise for the party, you may want to play around with the decor. We like using various Halloween decorations as well as costume props. We have found that Amazon has the best prices for costume props. We love Target for general Halloween decor. Crate and Barrel always has amazing Halloween serving dishes. Even stores like Family Dollar, Dollar Tree, or thrift stores have some fun finds. Adding little touches like decorative cocktail picks, interesting serving platters, and cool glasses make all the difference. If hosting a potluck, ask friends to decorate whatever it is they are bringing and you will have a plethora of fun and decorated dishes! The Black Eyed Stickman– A Blair Witch inspired cocktail based off of The Preakness Cocktail, The Black Eyed Susan. Witch Sticks– A Blair Witch Project inspired treat which blends salty and sweet! 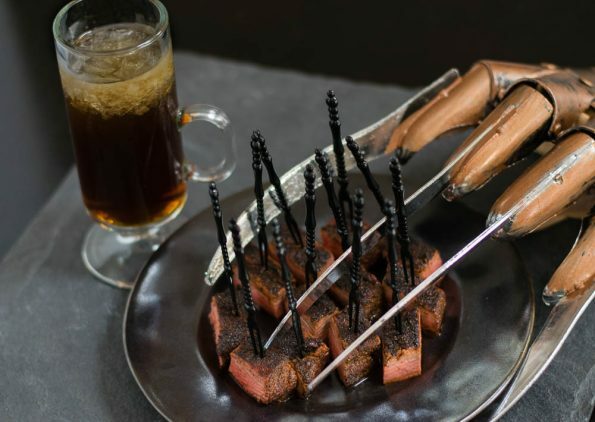 Never Sleep Again: A Nightmare on Elm Street Inspired Pairing– A pairing inspired by A Nightmare on Elm Street that blends coffee and smoky flavors. 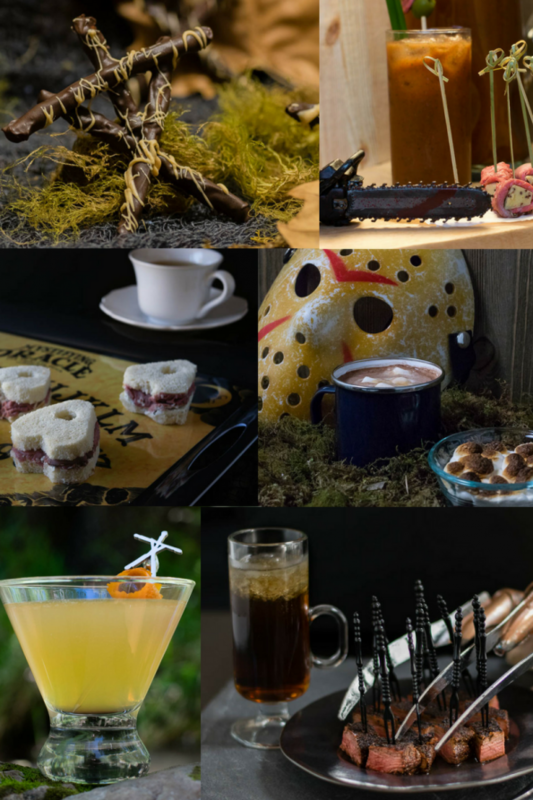 Not Your Mother’s Snacks: A Friday the 13th Inspired Pairing– A pairing inspired by Friday the 13th that is definitely unlike anything you’d find at Camp Crystal Lake but are delicious none the less. 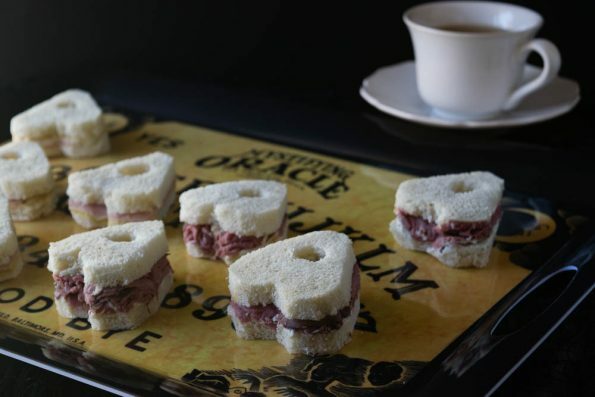 Planchette Tea Sandwiches– A Ouija: Origin of Evil inspired recipe that not only tastes great but is visually interesting as well. The Snack is Family: A Texas Chainsaw Massacre Inspired Pairing– A pairing inspired by Texas Chainsaw Massacre that pays homage to the Sawyer family and their Texas lifestyle. We hope this guide helps you throw an amazing Horror Movie themed party! We’d love to hear all about your party! Leave a comment below or use the hash tag #GeekEats on your party photos! Hahaha! These ideas are so much fun! Love your format and pictures. I absolutely love this! So many interesting ideas. I don’t think that I love watching horror movies though, they have a huge impact on me and I won’t be able to get over a scary scene for a long time haha. The recipes suggested sound so cool! I loved watching horror movies growing up, and then would have trouble sleeping for weeks. I wonder what would happen if I actually threw a horror movie theme party, ha ha.